With the proliferation of digital video cameras, everyone has been trying to make them look more like film. Assuming that your camera shoots at the right frame rate and offers film-like motion blur and highlight handling, the rest gets down to grain and colorimetry. That’s where various software tools and filters come in. A new film stock emulation application is FilmConvert, from New Zealand-based developer, Rubber Monkey Software. They are best known as one of the early developers of processing and rendering software for the RED One camera, but have now expanded that expertise into tools designed for a wider appeal. FilmConvert is available as a standalone application and as plug-ins for Adobe After Effects/Premiere Pro (Windows or Mac), Photoshop and Apple Final Cut Pro X/Final Cut Pro 7/Motion. The standalone FilmConvert Pro goes beyond just film emulation to include a powerful three-way color corrector and render management. The software works with QuickTime files and native RED .r3d files from a RED One or EPIC. It also supports roundtrips between FilmConvert and your NLE using XML and EDL files. 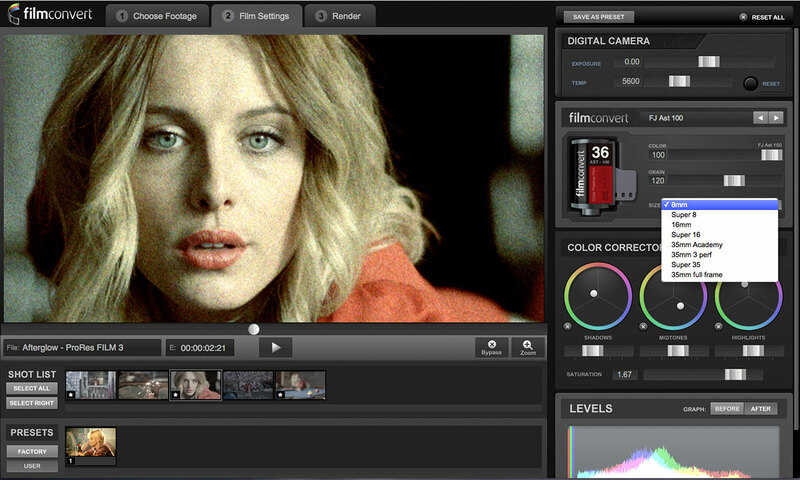 At the time of this writing, only the film emulation module is available in the plug-in versions. (Rubber Monkey plans to add color correction to the filters in the near future.) To create the film stock emulations, the developers analyzed scans from a variety of color and black-and-white motion and still photo stocks made by Kodak, Fuji, Ilford and Polaroid. By shooting color charts with these various stocks, they were able to engineer custom color curves that enabled them to produce digital camera images, which closely resemble the same appearance as these scans. That color science forms the basis of each film stock preset. FilmConvert Pro and the FilmConvert filters work slightly differently from each other. The standalone version allows you to set the initial color profile of the image as either a default sRGB or as StatusM Log – a flat setting similar to ARRI Log-C, BMD Film or RedLogFilm. If your camera file was already encoded with a flat gamma profile, then leave the viewer set to sRGB, so you don’t apply a log curve twice. Thanks to their work with the RED cameras, native .r3d files can be imported and are automatically detected, so that the “as shot” metadata may be applied. Native Canon and other specific digital cameras (GH2, Alexa, C300 and the Blackmagic Cinema Camera) are currently being profiled by Rubber Monkey engineers. The After Effects plug-in includes a pulldown menu to select the camera profile as a starting point for any adjustments, but log-to-video conversion must be done with other filters. There are no camera profiles in the FCP X version of the filter, yet. 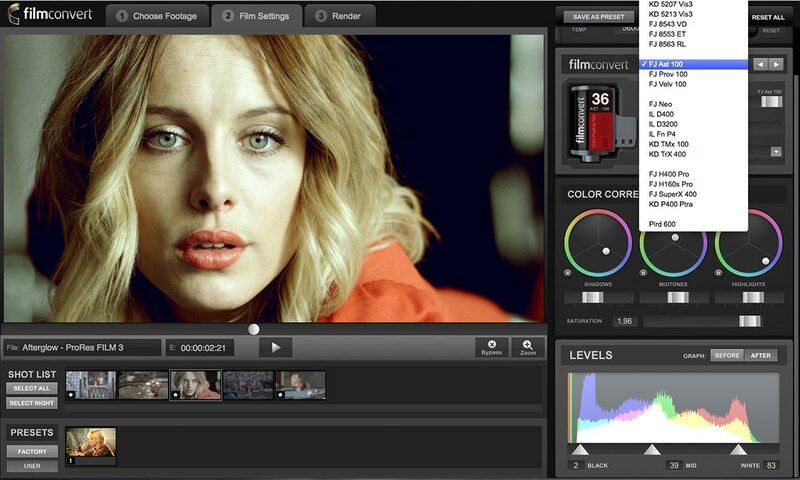 FilmConvert Pro includes a color correction toolset as part of the standalone application. The color correction module includes color balance wheels and luma sliders for shadows, midtones and highlights. There’s a saturation slider and a levels pane for black, mid and white points. Between the color corrector and levels, you get much of the same horsepower as the primary grade settings available in any high-end color corrector. FilmConvert comes with a series of presets, like “70s Home Movies” or “Matrix”, but you can also create and save your own. Any of these may be applied to clips on your timeline. You won’t find the typical RED color science and debayer settings seen in Redcine-X Pro or some of the RED SDK importers. Rubber Monkey explains their approach this way, “For extract settings with .r3d, we choose the best extract settings for our emulation. If the user changes the extract settings then the starting point will be different and it will throw out the film emulation. If our film emulation is applied at 100% you get an sRGB film emulation, not a variation of a RED colorspace – so the actual input color space is not quite significant in this case. The .r3d debayer always uses the size that is greater than (or equal to) the size being rendered. So if you are rendering to 1080p, then we will render at 1/2 debayer. Basically we made it so that we are always scaling down, never up, but also going with the fastest debayer that would not sacrifice quality.” FilmConvert Pro also supports the RED Rocket card for hardware-accelerated rendering of .r3d files. The FilmConvert filters work like any other plug-in, where the host application controls how the media is sent to the plug-in and then the subsequent renders. The standalone version includes its own render management tools. Render options include QuickTime (H.264, MPEG-4, ProRes or uncompressed) and image sequences (DPX or TIFF). The default export sizes can be up to 2048×1152 (or larger custom sizes) with fit width/fit height/stretch controls. This is great for RED projects that are rendered into HD or 2K formats. There are two workflows to handle renders. The first is to simply import one or more clips into FilmConvert Pro, apply the look you want for each clip and set these up to render as complete, individual clips. The other option is to edit the footage first without effects in an edit system and then export an XML or EDL file for the completed sequence. FilmConvert Pro will import the file and locate the clips. In the case of RED camera files, you can choose to link to .r3d files instead of QuickTime .mov files that may have been used for edit proxies. Each clip is loaded onto FilmConvert’s timeline with markers for each section of a clip that was used in the edited sequence. Unfortunately, you can only apply one setting to the full clip. If it was an outdoor shot and you used a portion that was overcast and then a later section of the same clip where the sun came out, there is no way to split the clip in order to have two different adjustments. When you render these clips as QuickTime movie files, the complete duration of the file is rendered, but images are only rendered for the sections that show up in the EDL or XML file. The rest of the file appears with a placeholder graphic. Rubber Monkey took this approach to maintain one media file when multiple portions are used in the edit – rather than to render separate, shorter clips for each portion. A single media file keeps the same file name and is easier for applications to relink. New, multiple media files require an additional naming convention – such as appending a numeric suffix to the file name, like .001, .002, .003, etc. – in order to preserve unique file names. The latter method is how Resolve, SpeedGrade and Baselight handle such renders. This requires the generation of new EDL, AAF or XML files so that the media can be correctly relinked in the roundrip back to the NLE. Rubber Monkey promotes its render prowess and speeds were good on my 8-core 2.26 GHz Mac Pro. I don’t have a RED Rocket installed, so a 4K 16:9 RED file (exported as a 1920×1080 ProRes file) took about 20 minutes for a clip of 4933 frames (about 3.5 minutes of footage). By comparison, 1080p QuickTime files rendered at near-real-time speeds – some faster, some slower. In most color correction applications, you can specify the length of render “handles”, where the clip gets with an additional second or two of media at the head and tail of the exported clip. It appears that FilmConvert adds five frames to the head and six at the tail (24fps clips), but there’s no place to increase that or to set a custom length. FilmConvert Pro doesn’t support i/o hardware like AJA or Blackmagic cards, so you are making color correction judgments by viewing the interface on your computer screen. By eye, I would say that the display within the FilmConvert interface looked a bit “warmer” and more saturated than an exported file viewed in QuickTime Player X (not surprising), but also as compared with FCP X. It tended to look closest between FilmConvert and FCP 7. If issues such as SDI monitoring and clip control are critical for your workflow, then one of the NLE plug-ins might be a better option than the standalone application, especially once this plug-in gains color correction controls. I’m sure as the application matures, some of these missing features will be addressed – along with better documentation. Rubber Monkey is also working on an OFX plug-in to cover Vegas, Scratch and Nuke users. Whether a plug-in or the standalone version is right for you depends on your need. Do you just want to augment a few shots or build a pipeline around this look? The film stock looks are spot-on and if you want something vintage, then the Polaroid emulation is really nice. If you want your digital media to come closer to the look of film, FilmConvert is definitely worth the investment. This entry was posted in apps-gear-filters, color grading and tagged color grading, plug-ins.